What Is A Certified Master Chef ? With two Certified Master Chefs, the 146-year-old Cleveland club is elevating its dining program and the level of professionalism within its staff. When Arnaud Berthelier, Executive Chef of the Union Club of Cleveland, successfully passed the American Culinary Federation’s Certified Master Chef (CMC) examination this past February, he propelled the 146-year-old city club into the spotlight. “We are the only private club with two Certified Master Chefs on staff,” says Lawrence McFadden, CMC, General Manager and COO, who passed the same examination in 2001 and came to the club in 2015. Berthelier runs the culinary operation. McFadden runs the club. Together, they are elevating not only the caliber of the Union Club’s food-and-beverage program, but also the level of professionalism within its staff. 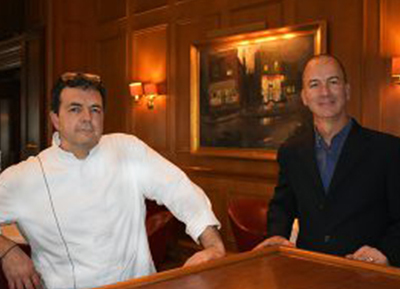 Arnaud Berthelier, CMC, (left) and Lawrence McFadden, CMC, are elevating the Union Club’s dining program as well as the level of professionalism within its staff. At that time, the chef who had been with the club for nearly 20 years decided to move on. McFadden then began looking for a new chef, which led him to Berthelier. “I wanted someone for whom cooking was not just a job—but a passion,” he says. Berthelier had been working at The Everglades Club in Palm Beach, Fla. as the Executive Sous Chef. He was in the process of preparing for his CMC certification. Berthelier accepted the position, sight unseen. Berthelier arrived in October 2017 and spent the first few months getting his arms around the operation, while simultaneously studying and preparing for the exam. All his hard work paid off. Berthelier passed in February and, armed with three new letters behind his name, began focusing on improving the operation. © 2017 Master Chefs Institute. Contact us to receive a free generic sample Master Chefs' Report or to learn how to submit your foodservice product, beverage, or equipment for evaluation.